On the same day (January 30), PAL will also start non-stop service between Clark and Davao thrice weekly (Wednesday/Friday/Sunday). Departure from Clark on PR831 will be at 10:50AM and arrival in Davao will be at 12:45PM; PR832 departs Davao at 1:25PM and arrives in Clark at 3:15PM. On March 26, the PAL Clark hub begins its thrice weekly (Tuesday / Thursday/ Saturday) operations to and from Puerto Princesa. PR877 leaves Clark at 10:50AM and arrives in Puerto Princesa at 12:20PM; PR 878 leaves Puerto Princesa at 1PM and lands in Clark at 2:30PM. 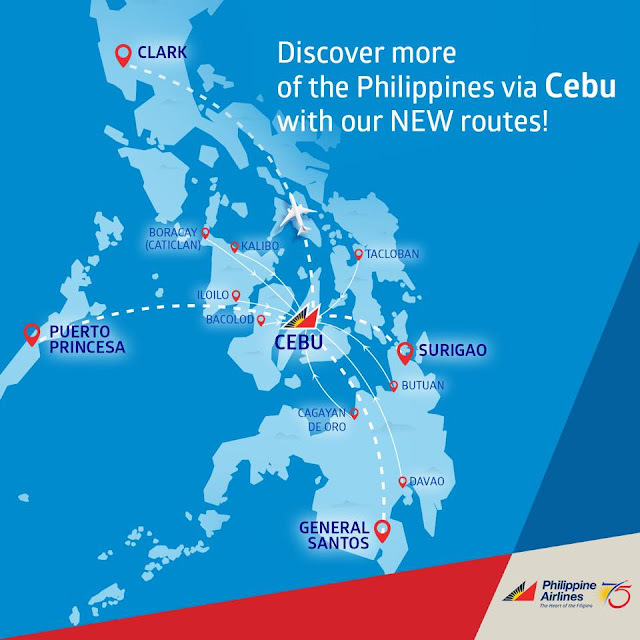 “We aim to cater to the flight needs of Northern Metro Manila, Central and Northern Luzon residents. Now, they will be able to experience the convenience of easy travel from their homes to the Clark Airport. Travelers from abroad and domestic outlying stations may fly to Clark and journey on to popular travel spots in the Luzon area”, PAL President and COO Jaime J. Bautista points out. Passengers will experience the airline's distinct brand of heartfelt service on board each and every PAL flight, which offers free baggage allowance, free snacks for domestic flights and hot meals for international travels. For reservations, passengers may call PAL Hotline (02) 855 – 8888, log on to www.philippineairlines.com or visit the nearest PAL ticketing office or partner travel agent. Clark to Busuanga, please.... Thanks! Mla to cdo, round trip feb 26-28? manila to davao march 25,2017 byahe? mgkano?